Steve Roenker, co-founder, and director of My Nose Turns Red Theatre Company, has 30+ years of experience as a performer and arts educator. The great clowns and physical comedians of his childhood sparked Steve’s interest in the theatrical clown and youth circus. The list includes Lucille Ball, Desi Arnez, Red Skelton, Sid Caesar and the entire cast of Your Show of Shows. In his tween and early teen years, he discovered the great clowns of the silent movie era: Charlie Chaplin, Buster Keaton, and Harold Lloyd. Eventually, this love of physical comedy became Steve’s career path. Steve studied clowning from John Towsen and mime from E. Reid Gilbert. In 2006, Steve had the opportunity to study with Cirque du Soleil’s Cirque du Monde focusing on teaching circus skills for at-risk youth. Since 1997, Steve has been directing My Nose Turns Red youth circus program. Jean St. John, co-founder, and volunteer began working with Steve Roenker in Lexington, Kentucky in 1980. By 1984, they moved to Cincinnati and officially incorporated as My Nose Turns Red Theatre Company. Jean studied mime from E. Reid Gilbert and clowning with Avner Eisenberg. Together Jean and Steve toured for 15 years performing as Juice and Shootang, their clown characters, for schools, libraries, special events, performing arts series, and conferences. Their work included in-school residencies with the Kentucky Arts Council and professional development for teachers. Jean continues to be inspired by the youth as they learn new skills, become team members and share their talents with others. Having worked in youth circus long enough to see many students graduate high school, attend college and start their own careers, she is impressed with the values it instills by challenging physical skills, developing leadership and teamwork, and demanding dedication—all through the joy of performance. She is currently the Arts Education Director for the Kentucky Arts Council. 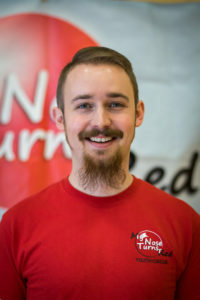 Jesse AlFord is a freelance Circus Coach and Lighting Designer, based in Louisville, KY. His circus life began at the age of 6, with the Great Y Circus in Redlands, CA. Unicycling ever since, he has performed with Circus Bella, The Zoppe Family Circus, Suspend Productions, and many more. He has trained at the San Francisco Circus Center, and also taught with The Great Y Circus, Prescott Circus Theatre, Circus Culture, Suspend Louisville, The Louisville Turners, and countless workshops and camps across the country. He has served on the Board of Directors for the American Youth Circus Organization since 2010 and has been Board President since 2014. Natalie Roenker is a graduate of Northern Kentucky University where she has a degree theatre and a minor in dance. 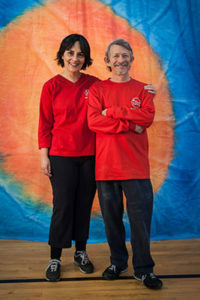 She has recently completed 80-hour social circus coaching training from Cirque du Monde at SANCA Seattle. Natalie has been studying circus since she was five years old. She likes circus because it is a non-competitive way to stay active. She also likes the opportunity to coach younger children. Natalie coaches the 4-7-year-olds, beginning circus class, wire, and hoop. She is the assistant coach for all of the after-school circus sites. Circus Youth in Action (CYA) is My Nose Turns Red’s teen leadership program. 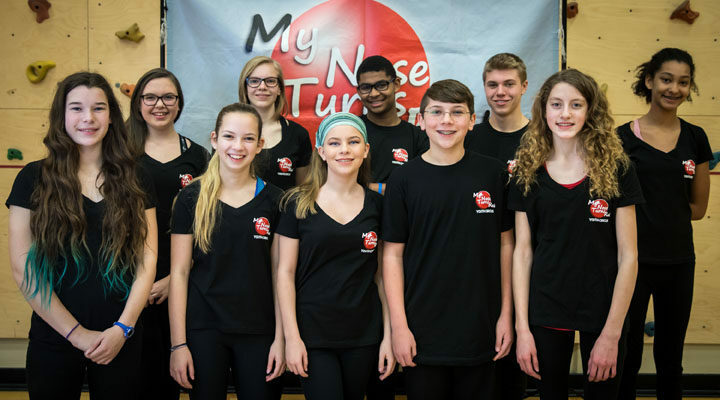 Members are a part of MNTR’s Advanced Circus Ensemble. They receive instruction on safety, giving instruction, etc. as well as developing solo and group acts. 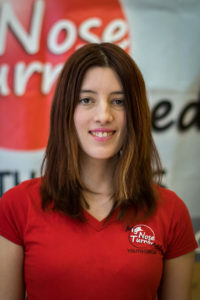 CYA members are valuable members of MNTR’s teaching staff. Many serve as assistant instructors at camps and after-school programs.